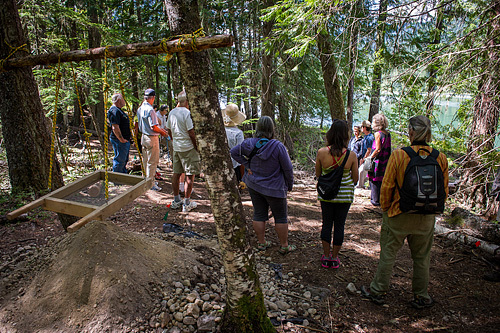 On July 13th, the Lemon Creek Archaeology Field School in South Slocan, operated by New York’s Hamilton College, hosted an open house and invited the public to come and see what the site is all about and what Selkirk and Hamilton College students unearthed this summer. 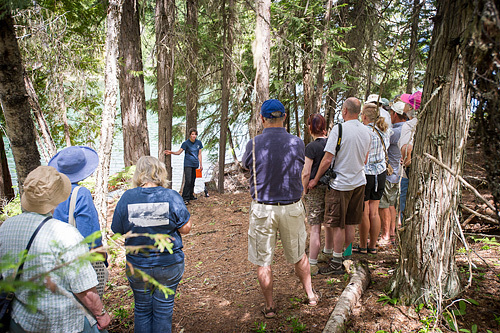 The event was held at the Slocan Narrows Pithouse Village and showcased the student’s discoveries through informative lectures given by the site’s director, Hamilton College professor Nathan Goodale, as well as guided tours to highlight what was learned over the summer. Selkirk field school student, Micheline Marr, discusses the student's new discoveries with participants at the recent open house. 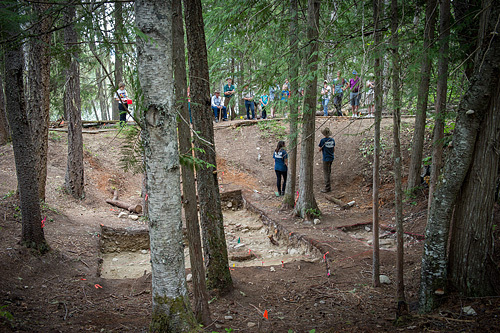 Hamilton College partners with Selkirk College to provide spaces for both Selkirk and Hamilton College students, and since June 10, they have been on site training in archaeological excavation techniques, ethnography, linguistics, and oral traditions of the interior Pacific Northwest and Upper Columbia River drainage. Professor Goodale has been working with his co-director, Hamilton College visiting instructor of anthropology, Alissa Nauman, to provide the students with an outstanding learning opportunity. Field school students share interesting information on what they've learned from the 2700 year-old pithouse this summer. Saturday’s open house was an interactive event and provided opportunities for participants from around the area to learn about the school’s significant finds and get excited about archaeology. The event also helped raise money for the Slocan Valley Heritage Trail Society, with proceeds from the BBQ going towards interpretive signage and other enhancements along the Slocan Valley Rail Trail. Participants of all ages get some hands-on experience and learn about the school's significant finds over the summer. Participating in the open house and highlighting the work of the school builds on Selkirk's strategic directions to increase enrolments, and engage the wider community in learning and developing innovative programs and services. For more information, please contact David Feldman, School Chair at 250.365.1331. Learn more about the Lemon Creek Field School and University & Arts Anthropology Courses or visit our UAS Facebook page. Learn more about Hamilton College.